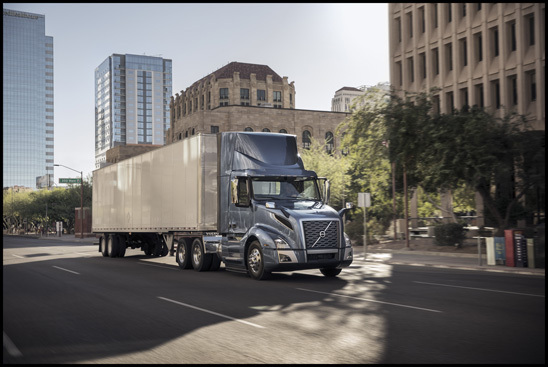 The new Volvo VNL 300 daycab is now available with the latest version of the Cummins ISX12N “Near Zero” natural gas engine, providing an alternative fuel solution for pick-up and delivery and regional-haul operations. With available engine ratings of 350 horsepower with 1,450 lb-ft torque up to 400 horsepower with 1,450 lb-ft torque, the ISX12N natural gas-powered engine is approved for gross combination weights of up to 80,000 lbs, making it well suited for heavy-duty regional-haul truck and tractor applications, port drayage, vocational, refuse and conventional straight truck applications. The natural gas power plant can be operated on compressed natural gas, liquefied natural gas, or renewable natural gas. The ISX12N engine is OBD (On-Board Diagnostic) compliant and U.S. EPA and CARB certified.